Put on a jumper and give a child a better future. A special occasion for us all to come together, as a force for good in a different way. To be able to have fun, while contributing to projects both in Italy and worldwide, for Save the Children. 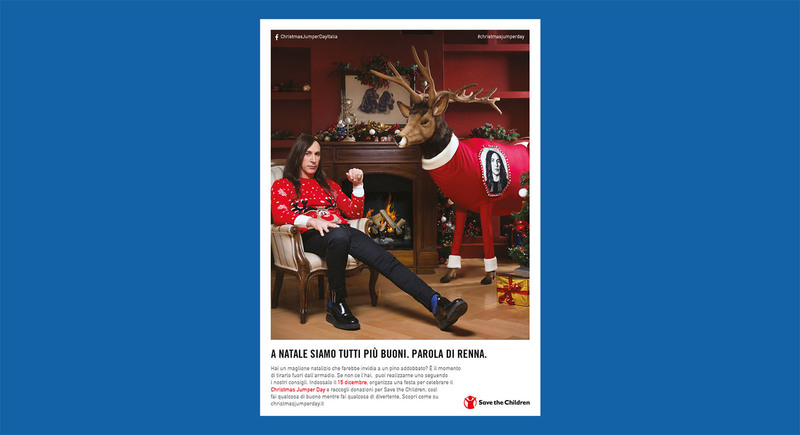 With the celebratory endorsement of Manuel Agnelli, the campaign drew on his character as both a Rocker and strict TV judge, to invite us to join him in support of Save the Children. The ad was shown in cinemas, television and through our client’s social media platforms. It featured in the major newspapers online and the campaign also ran in the national press. Lo SpinOff Video andato in onda sul web.